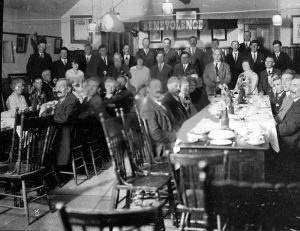 Knights of Pythias members gathered around dining tables, Knights of Pythias Hall, Nakusp. TOP(standing l-r): Bowes, E. Dilley, Archie Herridge, Reuben Buerge, Humphris, Henry Aalten, Butlin, Oscar Salstrom, Horrey, Wensley, ?, Ed Parkinson, ?. 2ND (standing l-r): Martin Fry, Mrs. Jones, C. Bradshaw, Sid Leary, Jim Morrison, Mrs. Leveque, Mr. Leveque. SEATED FAR LEFT: Mrs. Jones Sr., J. Parent, Mr. McWhirter. SEATED 2ND LEFT: ?, Bert Herridge, F. Vipond, Mrs. Vipond, Mr. Horsley, F. Harvey (Mrs. Lodge?). SEATED CENTRE: Mr. Hamling, Mr. Harvey, Mrs. Harvey, Mrs. Aalten/Mrs. Beckett?, E. Munn, E. Buerge. 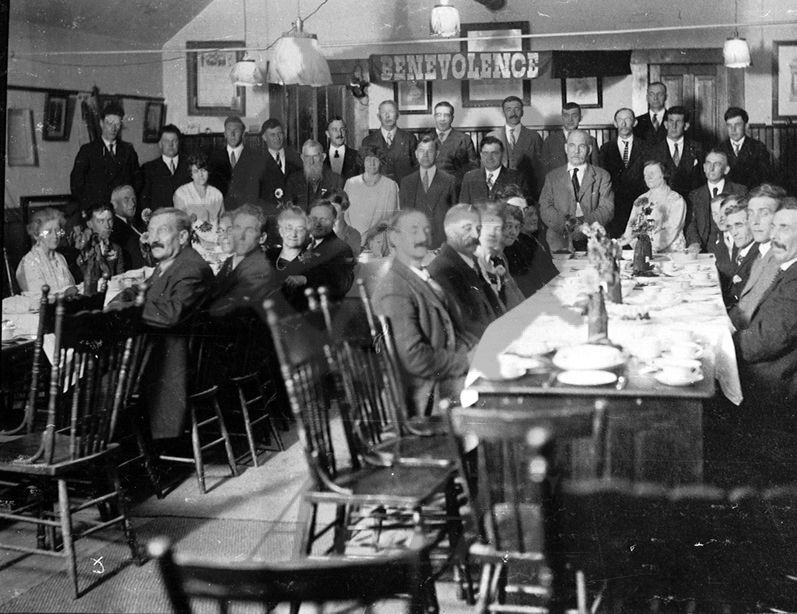 SEATED LEFT (bot to top): Mr. Millar, Mr. Wahlstrom, Mr. Thurgood, ?, ?